Yes, taxes are a reality – before, during, and even after retirement. But honestly, I don’t think or worry too much about taxes until tax time. Then I just download a copy of TurboTax and go to work. My tax returns have never been very complicated. So, I have always done them myself using Intuit’s TurboTax product for many years now. Since I also use Quicken for online banking and bill pay, I can take advantage of the synergies between the two. However, if you are a do-it-yourselfer, there are other excellent tax preparation packages and online services out there that you might consider. If your financial situation is complex, or if you have any tax “troubles,” then, by all means, consult a tax professional. A CPA is best. As you know, there has recently been more noise than usual about taxes since a new tax law was just passed that will take effect on January 1, 2018. If you are still working, you may see some changes in the amount withheld from your paycheck next year. But you will probably see the most benefit when you file your 2018 tax return in early 2019. Having some level of understanding about taxes and how they may affect you in retirement is part of wise retirement stewardship. Tax laws have always been notoriously complex, hence our heavy reliance on pricey software or tax professionals and preparers. Even if you use a professional, it’s a good idea to at least understand the basics. Some have claimed that under the new tax law many people will be able to do their taxes on an index card. We shall see. Opinions about taxes are all over the place. One view is that taxes on the wealthy and corporations should be higher – i.e., we need a “progressive” tax. Another view holds that it would be best if there were less tax, less spending, and smaller government, across the board. (That’s what the tea party was all about.) I guess everyone would like the tax code to be simpler and easier to understand. I’m not writing to push a particular viewpoint, but the historical Biblical view of taxes was based on the tithe. In ancient Israel, taxes were universal in scope, proportional rather than progressive, and the methods were simple and transparent. Not surprisingly, taxes are not a major topic in the Bible, but they do come up here and there. The Bible doesn’t tell us whether one tax system or ideology is better than another – we have to figure that out for ourselves. Regardless of which system you prefer, I think it’s safe to say that none of us like taxes. Most of us view the tax code as requiring too much of our hard-earned income, at best; and at worst, as corrupt and unfair. The simple truth is that the Bible commands (yes, commands) us to pay our taxes (see Matt.22:17-21 and Rom.13:1-7). In fact, the only time when we can in good conscience disobey the government is when it tries to force us to do something that the Bible explicitly forbids. The Bible does not forbid us paying taxes; in fact, it is encouraged. That said, I don’t like tax collectors any more than you do. (I’m referring to agencies, not people. Fortunately, we don’t have people who come knocking at our doors demanding 80% of everything we have.) They weren’t real popular in Bible times either (see Matt.11:19, 21:31-21; and Luke 3:12-13). And I certainly don’t want to pay any more than I have to, nor does Scripture obligate me to. Therefore, I want to get every tax break that I can that is both legal and honest. I suspect you feel the same way. Almost everyone will pay some taxes in retirement. The only exception would be those who are living on Social Security alone – they will pay little or nothing. Most middle-income retirees with incomes between $30,000 and $60,000 will pay relatively little. That’s because the effective tax rates for those retirees won’t be very high. Wealthy retirees will always have large tax bills, how large will depend on the laws and the marginal rates in effect at any given time. There are a lot of people out there with their various taxation agendas. They want to get us all excited about taxes and convince us that one group or another is going to be severely hurt by the new laws. Retirees are particularly easy targets for stirring up FUD (fear, uncertainty, and doubt). That’s mainly because of the government entitlements they receive, such as Social Security and Medicare. Most of us don’t need to worry. But we don’t want to have our heads in the sand either. It is important to understand the impact taxes will have on your financial picture in retirement, especially your effective tax rate. Remember, your “effective” tax rate is the percentage you actually pay on your taxable income – it is not the same as your marginal tax rate, which is typically higher. More on this later in the article. If you are 10 or 20 years away from retirement, it would be almost impossible to predict what your taxes will be in retirement. If you use a retirement calculator, it will ask you to make assumptions about certain variables. Even if you try, there is a lot of margin for error. Also, some may find themselves at higher marginal tax rates in retirement due to a combination of Required Minimum Distributions (RMD) from retirement savings accounts and Social Security taxation rules. According to Forbes, your taxes may be less in retirement because, under current law, not all your income is taxable. Also, your income may be less than it was pre-retirement. And finally, your effective tax rate could be lower depending on what the tax code is at the time. That would be especially true if you are in a lower marginal bracket. However, my suggestion is to be conservative and assume that taxes will be higher, not lower, especially if you are 10 or more years out. If you are very young, you may want to assume that Social Security benefits will be fully taxable if you have any other income. Those who are on the verge of or in retirement have probably been watching the current tax legislation with some interest. We have the same question that everyone else does: How will it affect me? Well, the most significant changes are to the marginal tax rates, personal exemptions, and some deduction rules. Other provisions are relevant to retirees. The standard deduction has been increased (doubled, in fact), but personal and dependent exemptions will no longer exist. An exception is the additional standard deduction of $1,300 for married taxpayers who have reached age 65 or who are blind. It will be $1,600 for unmarried taxpayers. There will also be changes to itemized deductions, most notably the rules about the deductibility of interest on mortgages and home equity loans. Under the new law, deduction of interest on mortgage debt is allowed but only up to $750,000 for new loans after 12/16/2017. According to the new law, it has to be debt that is directly related to “acquiring, constructing, or substantially improving” your qualified residence. In other words, the interest on many home equity loans will no longer be deductible. The mortgage interest deduction for second homes was retained. Property and state income taxes will still be deductible but will be limited to $10,000 per year combined, which is a potential hit to those living in high property and income tax rate states. Other itemized deductions such as medical expenses and charitable contributions remain in place. However, they may become less significant due to the increase in the standard deduction. For married couples, it was doubled to $24,000. The new standard deduction is large enough that it’s likely that many people who typically itemize will not do so for tax year 2018. Some financial advisors are suggesting that those who routinely make substantial charity contributions consider paying ahead in 2017. Talk to your tax professional to find out if that might be something you could benefit from. I ran some rough calculations myself, and I found that there would be a slight advantage to pre-paying my charitable contributions (mainly tithes and offerings) in 2017 instead of paying them as I normally would in 2018. That’s because if I pay them in 2018, I would still be able to itemize my deductions when I file in 2019 (i.e., my itemized deductions will still be greater than $24,000). It may be more advantageous to you to pre-pay if you don’t think you would itemize under the new law because your itemized deductions will be less than $24,000. Even with the new tax law, most of us will continue to pay taxes in retirement. Taxes in retirement aren’t that different than before retirement. Like any expense, you’ll need to plan and budget accordingly. One big difference is that they won’t necessarily be withheld like they are when you are getting a regular paycheck. You may have to do your own “withholding” to make sure you comply with IRS rules. The IRS doesn’t say that you have to automatically have taxes withheld from a 401k or IRA distribution. But it is possible that whatever institution is managing your account may have a policy to automatically withhold a percentage of your distribution. You may still have an option to select the percentage or not to have anything withheld at all. It can be a problem if your tax bill is more than a certain amount and you haven’t made regular payments of your estimated taxes throughout the year. Better safe than sorry! Social Security Income. If Social Security is your only source of income, you probably won’t pay any income tax. That’s because deductions will substantially reduce your taxable income to near zero, and the formula that determines how much tax you pay will take that into account. If you have other income, you may be taxed on up to 85 percent of your benefits. How much is taxable could be anywhere from zero to eighty-five percent, depending on how much other income you have. How much tax you pay will depend on your total taxable income and where you fall in the new marginal tax table. IRA and 401(k) Withdrawals. In most cases, income withdrawals from retirement accounts are taxed in retirement. That pertains to withdrawals from IRAs as well as 401(k)s, 403(b)s, 457s, etc. You have to report them on your return, and they will be added to your Social Security income to come up with a total. An exception is when you are withdrawing income from Roth IRAs. Withdrawals from Rotch accounts are usually tax-free if done correctly. How much tax you pay depends on your taxable income (total income minus credits and deductions) and your effective tax rate for that year. Pension Income. Pension income is typically taxable. Pensions are usually funded by your employer with pre-tax dollars, which means that all income received will be taxable. If a portion of your pension was funded by your after-tax dollars, then some of your income will be taxable and some will not. If you receive a lump sum distribution and roll it over into an IRA, you will not have to pay taxes on it until you start withdrawing from it. Annuity Income. If you have an annuity in an IRA account, then the same rules as IRAs will apply when you start receiving annuity payments. If you purchase your annuity outside of a retirement account, then the tax rules that apply depend on what kind of annuity it is. There are differences between income from an immediate annuity and withdrawals from a fixed or variable annuity. If this pertains to you, do some research or consult your tax professional. As a simple example, I am going to use a retired 66-year-old couple with total income of $60,000/year. I will assume that their income includes $32,000/year in Social Security benefits and $28,000/year income from savings/investments. Since 85% of the couple’s Social Security benefits will be taxable, we can calculate their ordinary income as follows: $28,000 plus .85 x $32,000 = $55,220. Because the tax rates are tiered, they will pay 10% on the first $19,050 of taxable income, and 12% on the amount between $19,051 and $77,500. That makes their estimated tax bill $3,254. That’s less than $300/month and represents an effective tax rate of approx. 10.9% ($3,254 divided by $29,920 times 100 = 10.9%). Based on a rough calculation, our example couple would have paid taxes of $4,230 on taxable income of $34,420 under the old tax plan, or $976 more. That’s an effective tax rate of 12.3% and put them in the 15% marginal tax bracket. Of course, your situation could be different. This calculation assumed a moderate income; yours could be much more or less. It also took into account the standard deduction, which doubled under the new law, and therefore no itemized deductions. If you have large itemized deductions due to mortgage interest, charitable deductions, property taxes, and medical expenses, you may be better off itemizing so that your taxable income will be less. Also, if your retirement savings are in a Roth IRA, that income will not be taxable. There are those who may see more significant impacts from the new tax law. For example, if you live in a very high tax state, then property and state income taxes can add up. If you itemize deductions, there is a cap of $10,000 on them in the new law. Wealthy people with huge mortgages may also see an impact. For the rest of us, I expect that we will be paying a lower effective tax rate in the years ahead based on the new tax law. But looking farther out past 2025, it would be hard to predict. As I stated at the top of the article, it’s always wise to assume that taxes will go up rather than down. And in reality, given the other financial variables at play (investment returns, inflation, Social Security, health care, etc.) 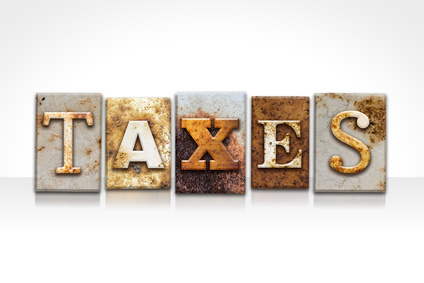 the relatively small percentage changes in income taxes falls well down my list of concerns. There is another reason I don’t spend too much time worrying about taxes – I can’t do much about them. If you steward your resources well – which would include planning for taxes, do your returns on-time and follow the law, and vote responsibly – there isn’t much more you can do. If you have a complicated financial situation in which taxes are a big issue, then, by all means, consult with a professional. Otherwise, practice wise retirement stewardship, pay what you owe on time, and then don’t worry about taxes until next year.